The Expec Advanced Research Center (Expec ARC) TeraPOWERS Technology Team, under the leadership of Saudi Aramco fellow Ali Dogru, achieved a major breakthrough with the industry’s first trillion cell reservoir simulation. Saudi Aramco’s cornerstone technology, the parallel oil, gas and water enhanced reservoir simulator (POWERS deployed 2000) has taken its next evolutionary step from mega-cell to giga-cell (GigaPOWERS achieved in 2010) and now to tera-cell (TeraPOWERS of 2016) simulation capability. “This is the world’s first trillion cell run, as well as a major breakthrough for the global scientific community. 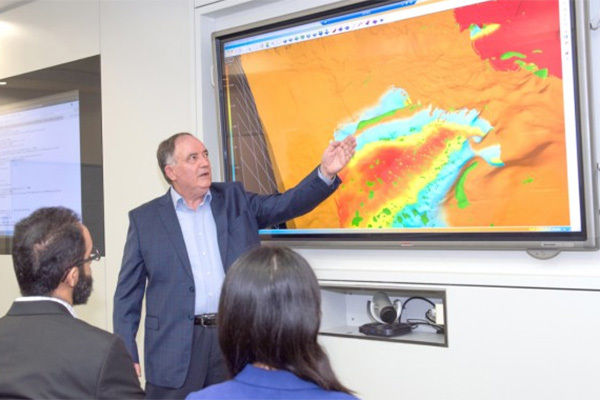 Using trillions of cells in a reservoir simulation environment was a long-awaited dream for the global petroleum industry and scientific community,” said Dogru. The breakthrough was achieved using the King Abdullah University of Science and Technology (KAUST) Shaheen II super computer. Expec ARC has supported and collaborated on a range of upstream research programs at KAUST over the years. Scientists used 150,000 cores — about 75 per cent of the capacity of the entire computer. Since the computing power requirements are so enormous for computational modelling technology development, KAUST provides Expec ARC access to the Shaheen II on an arranged basis. During these special requests, KAUST contributes super computer run time, as well as specialized personnel for system program support to ensure the runs go smoothly. “We could not have achieved this incredible milestone without the expertise and resources from KAUST, which provided superb support,” said lead TeraPOWERS developer Larry Fung, who was a founding member of the original POWERS and instrumental in the KAUST partnership. The world’s first trillion-cell run is a major breakthrough for the company and the global scientific community. Achieved in collaboration with the King Abdullah University of Science and Technology and its Shaheen II supercomputer, TeraPOWERS will be able to simulate oil migration problems in the Kingdom in a fraction of the time it once took.